I could make some snarky comments about this, but sometimes you just don’t have to say anything. 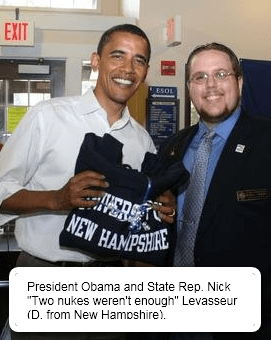 Yes, the Democratic representative for New Hampshire, Nick Levasseur, decided he wanted to indulge in gross stupidity and left the comment that "anime is a prime example that 2 nukes just wasn’t enough" on his Facebook page. Ignoring the silliness that is the dismissal of all anime — which is incredibly stupid, but the kind of stupid many people indulge in — and assuming that Representative Levasseur would not drop another nuclear bomb on Japan if given the opportunity, the biggest problem that I see is that New Hampshire has elected a politician stupid enough to say "anime is a prime example that 2 nukes just wasn’t enough" on his fscking Facebook page. Did he think it would be met with resounding cheers? Did he think that anime was a hot button issue that middle-class America desperately wanted violent retaliation for? Did he honestly think he could make a jest about dropping a bomb on another nation and not sound like a horrible imbecile? Bleh.